Alaska boasts more national park land than the rest of the nation combined. The state is home to eight national parks, including three of the largest in the nation. With 500 miles of track stretching from Seward to Fairbanks, the Alaska Railroad serves two national parks daily during the summer—Kenai Fjords and Denali—and can also easily arrange guest excursions to Lake Clark, Katmai and Gates of the Arctic national parks. 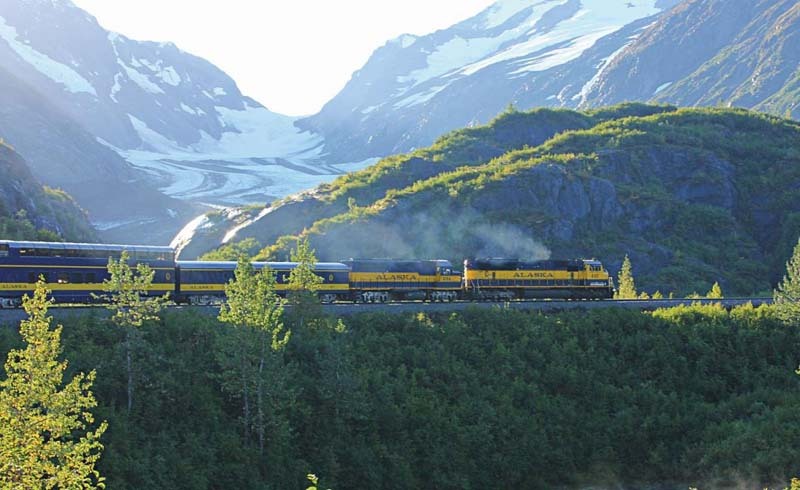 When the Alaska Railroad’s Coastal Classic Train completes the journey from Anchorage to Seward, passengers trade the rumbling tracks for the peaceful shores of Resurrection Bay, the gateway to Kenai Fjords National Park. With a landscape that is largely dominated by the 300-square-mile Harding Icefield, the park is home to nearly 40 glaciers and countless species of wildlife that thrive in the glacial-marine ecosystem. Kenai Fjords National Park encourages guests to experience the park on the water with a wildlife and glacier cruise, which can be booked as a group package or day trip through the Alaska Railroad. The fjords are home to an abundance of marine wildlife. Guests can watch for large bird rookeries, sea otters with pups and seals sprawled out on fresh chunks of glacier ice. As guests cruise along the lush, mountainous isle of the park’s namesake fjords to massive tidewater and piedmont glaciers, they learn about the area’s rich history from national park rangers while keeping their eyes peeled for whale breaches on the horizon. Humpback, gray and fin whales, as well as Dall’s porpoise, are most often found in Kenai Fjords National Park during the summer months. Orcas roam the waters year-round, though increasingly during salmon season, seeming undeterred by human visitors as they feed in pods. The season for whale viewing kicks off in spring as gray whales migrate through the Bering Sea, where passengers can begin to see their charismatic, gray noses peeking up from the icy blue waters. In May, the fjords begin to bubble with whale species ranging from fin whales rolling their long backs over the waters to humpbacks lunge feeding and more. Further north, the railroad hub of Anchorage serves as the perfect place to take a memorable day trip to Lake Clark or Katmai national parks in Southwest Alaska. The parks are home to some of the most concentrated and viewable bear populations in the state only accessible by plane. It's an incredible opportunity to view black and brown bear in these protected lands via a quick flight from Alaska’s largest city. Nestled between mountains and headwaters of Bristol Bay, Lake Clark National Park & Peserve comprises four million acres, encompassing 130 miles of coastline that boast world-class bear habitat, strings of turquoise gem lakes situated at the edge of alpine tundra, two active volcanoes and some of the world’s richest salmon habitat. Whether visitors find themselves on the banks of the Chinitna Bay or watching bears feed on wild salmon from a boat, the bear viewing is unlike any in the world. Fifty miles south lies Katmai National Park and Preserve, a vast wilderness home to a peaceful serenity of landscapes filled with untouched tundra, forests, lakes and mountains. Hidden among its four million acres sits the remote Brooks Camp where visitors will find another opportunity to experience some of the best bear viewing in the world. The Alaska Railroad makes these remote national parks easily accessible through day trips with its tour partners when passengers include Anchorage in their itineraries. 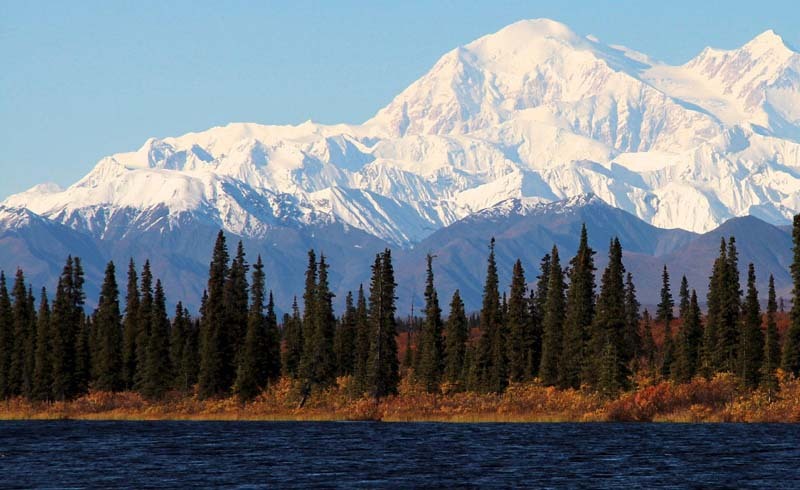 The Alaska Railroad’s aptly named Denali Star Train makes daily summer stops in Denali National Park and Preserve, connecting visitors from Anchorage, Talkeetna and Fairbanks to six million acres of Alaska’s most famed protected wilderness. The opportunities to explore are plentiful, but many visitors are drawn to the park for its charismatic local residents. The most sought-after sightings are Denali’s Big Five: moose, bears, caribou, wolves and Dall sheep. The 90-mile road that goes deep into the park is only accessible by private car up to mile 15, a distinction that makes Denali different and special from other national parks. To get beyond those first 15 miles, visitors can take a guided naturalist tour into the park. The best time for wildlife viewing is in the early morning or late evening, but it always depends on the day and time of year. The good news is that Alaska’s long summer days offer plenty of hours to fit in wildlife viewing. The Alaska Railroad can accommodate many kinds of groups that are interested in national parks and wildlife viewing, whether it's a large family for a reunion or a corporate group. To make sure everyone stays together, select the option to block seats when making reservations. This option works best for 15 or more people.